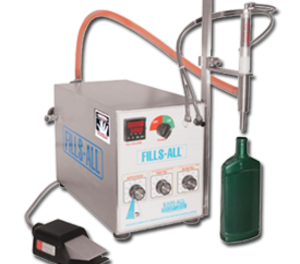 The Fills-All Model FA-GB portable single head gear pump filler comes complete with an all stainless steel enclosure, product supply gear pump and one nozzle with a fully adjustable nozzle rack and electronic controls. Electronically controlled flow rate and product volume. All stainless steel one piece welded cabinet. Dual discharge speed controls - (infinitely and independently adjustable) for fast pre-fill and slow final-fill. Comes complete with one pneumatic closed tip positive shut off type nozzle. Patented nozzle mounting clamp for ease of adjustments. Change fill volumes from several cc's to a gallon or more in seconds with only a push of button on the electronic fill control. Comes complete with quick disconnect color coded air lines for pneumatic closed tip positive shut off nozzle for quick and easy removal and disassembly of nozzle for cleaning. A. Single fill (with foot switch). B. Auto-cycle fill (with built in electronic operator adjusted time delay for 0 to 20 seconds between fills). C. Continuous fill (for special applications). Handles water thin to high viscosity products all on the same machine. Clean up is accomplished in minutes - no tools needed for disassembly. Sanitary stainless steel clamp ferrules for pump inlet and outlet for ease of cleaning and set up. Air filter/regulator and air supply switch for closed tip nozzle. Standard wiring is 110 Volt, 1 Phase, 50/60 Hertz. Air consumption is approximately 1/2 CFM at 60 PSI. Two year guarantee on all parts less tubings, gears, gaskets and seals (electronics are covered under manufacturers guarantee). 6 GPM (gallons per minute) product supply pump (to replace the standard 3.4 GPM pump). 1.9 GPM (gallons per minute) product supply pump (to replace the standard 3.4 GPM pump). All stainless steel support table complete with stainless steel leveling screws with floor pads. All viscous and highly accurate filling applications. Fills Vials to Gallons with water like to viscous products.. Ideal for applications such as: reduced speeds, short production runs, limited space and trial runs and R & D where precision filling of a wide range of product is required. - Air: 0.1-1 cu/ft per min. 90psi.